The Wiser Air is a smart thermostat that can talk to your smart meter. It will allow energy customers to more effectively manage their energy usage to save as much money as possible. It will also allow energy providers to better anticipate demand and more easily offer incentives for reducing usage during periods of high demand. That’s the plan anyway. So far the makers of Wiser Air, Schneider Electric, have not done that. But, there’s no cause for alarm just yet. Schneider Electric has been intentionally taking their time with the Wiser Air to make sure they do things right. UPDATE: It’s been over two years since the last Wiser Air app update. It appears development on this product has been stopped. Instead of focusing on features, the initial emphasis was on making sure the basic hardware of the thermostat was great. It is. Now their focus appears to have shifted to adding great software features. For the full review about the current features and what’s coming, keep reading. 5 What Does Wiser Air Need To Improve? Like most other smart thermostats, this one is designed to be operated on 24V power. This means that it will not be compatible with high voltage systems like electric baseboard heaters and wall convectors. It will be compatible with most other systems including forced air, radiant, heat pump, oil, gas, and electric. The Wiser Air requires a fair amount of power to run. As a result, it needs a constant source of power from the wall. It will never require batteries but does require a c-wire. In case you don’t have a c-wire, the thermostat comes with a workaround called the Wiser extender. The Wiser Air thermostat boasts a feature set that rivals all but the top smart thermostats on the market . There’s more on the way, but here’s what it has to offer right now. Schneider Electric released a major software update for the Wiser Air in the summer of 2016. EcoIQ was the biggest addition. It is the learning part of the Wiser Air. EcoIQ uses input from you to learn your schedule and how to keep you comfortable. On average, it takes about a week to learn your preferences. But, the more often you give it feedback, the quicker it will learn. To get started, EcoIQ requires two inputs from you. First, you will set the temperature limits. Choose the lowest temperature you wish to allow in cooling mode and the highest temperature you wish to allow in heating mode. The next setting is a simple slider where you choose how you want to balance comfort with energy use. During the learning phase, the Wiser Air will slowly drift away from the set point until you nudge it back in the other direction. If your comfort balance slider is set more towards energy savings, the drift will be faster. If it’s set more towards comfort, the drift will be slower. Using the EcoIQ feature is optional. If you choose not to enable it, the Wiser Air has a more traditional programmable schedule that takes its place. The goal of Wiser Start is to get your home to optimal comfort at the time you want while using as little energy as possible. This means that when you get out of bed on a cold winter morning, Wiser Air will have already have heated your home to your morning comfort level. Of course, making it warm when you get up is only half the equation. The Wiser Air thermostat tries to predict when it needs to turn on to save the most energy possible. It uses weather conditions and previous equipment performance to make this prediction as efficient and as accurate as possible. You don’t need a dedicated humidifier to effectively control humidity in most homes. Humidity Balance helps you control humidity by utilizing your air conditioner as a dehumidifier. There is a setting to choose the maximum allowable humidity in your home. If the humidity rises above that level, Humidity Balance activates. The thermostat will lower your cooling set point by 1 degree. That will cause the air conditioner to turn on and begin to dehumidify. Wiser Pulse is the name they gave to the thermostat’s backlight. At first, I thought it was kind of gimmicky that they felt the need to give a name to the backlight. But after seeing how cool it looks, I think I’ve changed my mind. The thermostat will give off a pulsing glow that lets you know what your system is doing. It will glow blue for cooling, yellow for heating, and green for when EcoIQ is active and saving you energy. The backlight intensity is fully adjustable from 0-100% with 0 being completely off. It’s pretty bright so you may want to shut it off completely if it happens to be located in a bedroom. But, if it’s in a hallway, it could function nicely as a nightlight. Imagine you just came in from exercising on a warm day. You want to turn on the AC for a bit to help you cool down, but you don’t want to mess up the EcoIQ schedule. That’s what this feature is for. Comfort Boost is a timed “boost” of heating or cooling that won’t affect your previously learned schedule. The boost can be set to last for anywhere from 5-59 minutes. The default is 15 minutes. To trigger a Comfort Boost, all you need to do is press and hold the up or down arrow. This can be done from either the thermostat unit or the app. The Wiser Air display includes real-time weather information and forecast. It also sends out relevant severe weather alerts. The weather information is provided by Weather Sentry. This is Schneider Electric’s very own forecasting service. It has been the number one ranked weather forecasting service for nine years in a row. 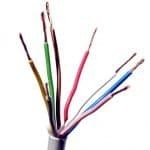 It is used by utility companies, airlines, and for sporting events. Wiser Air is now able to work with Alexa. Basic Amazon Echo integration is now available so you can control your Wiser Air thermostat with your voice. Wiser Air’s current feature set leaves the customer wanting more. Fortunately, that is the plan. It was released with a relatively meager set of smart features. But, Schneider Electric has been steadily adding more. The EcoIQ update this past summer was the biggest so far. This update added the smart schedule learning ability. It also fixed a problem where users were constantly having to sign-in to the app on their mobile device. Another update this fall added support for Amazon Echo. 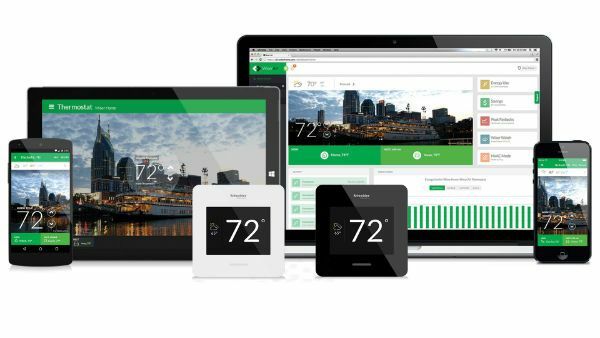 Basic temperature controls are available right now, and Schneider Electric plans to add support for EcoIQ features as well. Apple’s smart home voice control system, HomeKit is scheduled to be added early next year. Support for IFTTT was recently released. With a little bit of programming, IFTTT can be used as a DIY geofencing solution. Energy Insights. This is just their name for energy reports. It will allow you to see when you are spending the most and where you can save the most. Wiser Air is designed to be able to connect to your utility company directly through smart meters. 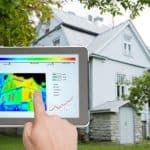 Schneider Electric is working with utility companies so that Wiser Air owners can benefit from energy company issued incentives during high demand hours. The thermostat includes a motion sensor. When you get near it, the large touchscreen display turns on. The 2.1 in H x 2.8 in W display makes operation easy even for those of us with fat fingers or fuzzy eyesight. After a short bit of time with no motion, the screen will turn off again. When the thermostat connects to the internet for the first time, it will begin to update. The updates may take awhile. Be prepared to wait up to 20 minutes or more while the Wiser Air brings itself up to date. Like any good smart thermostat, it has the ability to automatically switch between heat and cool modes. You can choose between four modes: heat, cool, auto, and off. Users have reported no issues reconnecting to WiFi after power outages or internet outages. This is huge. Inevitably, your power will go out or your WiFi will get flaky. If your thermostat doesn’t reconnect by itself when these things happen, it will probably end up being more of a headache than it’s worth. The Wiser Air passes this test with flying colors. There is no subscription fee to use the Wiser services. Once you purchase the thermostat, you create a free account and you’re good to go. What Does Wiser Air Need To Improve? Wiser Air’s existing features work great. I don’t have anything bad to say about them. The only strikes this thermostat has against it are the features that are missing. The Wiser Air does have home and away settings which they call “Ready Modes”. You can switch between modes manually using the app or automatically using static schedules. However, I wouldn’t consider those methods to be “smart”. The schedule learning feature of EcoIQ is what I would call smart, but it’s not very useful if you have an erratic schedule like I do. I don’t care how many math geeks they herd into a room, Schneider Electric will never be able to create an algorithm that figures out my schedule. There are two options that other smart thermostats use to deal with schedules like mine. One is motion sensors in the home. The other is using smartphone GPS to determine if you’re home or not (this is known as geofencing). The Wiser Air doesn’t have either of these capabilities (yet). There is no support for Apple HomeKit but it is reported to be coming soon. Wiser Air was lacking support for both Amazon Echo and IFTTT but has recently added it. 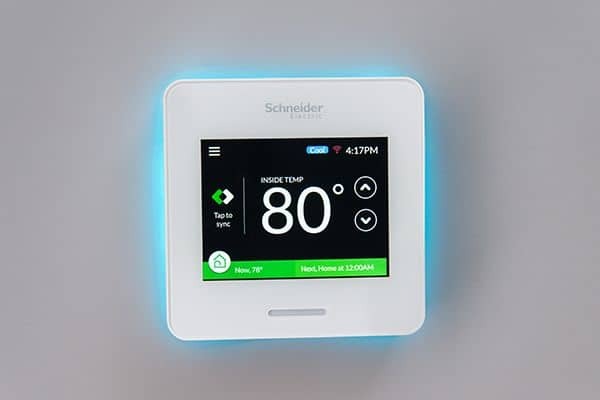 The Wiser Air thermostat from Schneider Electric has the ability to be the best smart thermostat available. It has a well-designed hardware base and is made by a company with deep pockets that has a lot of experience in energy management. However, the development team for Wiser Air seems to have stopped developing. The Wiser Air app hasn’t been updated since 2017 and nagging bugs remain. This thermostat is no longer a serious contender in the smart thermostat arena. The price has dropped accordingly, but even at a discount, I would look elsewhere. Do you have any experience with the Schneider Electric Wiser Air Thermostat? Do you have any questions I didn’t answer? Let me know in the comments below! every household. Thank you for the information. This technology is really cool. 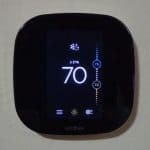 Do you need a smart meter for this thermostat to work, or does it just provide an added benefit? I also really like the humidity control. Thanks for the review! You don’t need a smart meter. The Wiser Air has the hardware built in to communicate with smart meters, however that feature has not been released yet. Thanks for the detailed review. The lack of a Home/Away feature isn’t a deal-breaker for me, as I have a fairly consistent schedule. It’s other features more than make up for this. Anything that will manage my energy usage and save me money, works for me. One is for home and one for away, but it appears to me (could be wrong) that they do not work with the auto-learning algorithms of EcoIQ and your preset schedules so you have to choose which to use and manually switch vs. just leaving on vacation and forgetting about everything….. which is something I would not be comfortable doing anyway (maybe with a smart phone GPS feature, but it would need to track the entire families phones not just one). Thanks for the info Bill. I edited the article to clarify the difference between ready modes and smart home/away features. Last I checked, the plan was to release support for IFTTT in Spring of 2017. This would allow users to create their own geofencing (smartphone GPS) feature. There is also another service on IFTTT which allows you to do geofencing with multiple smartphones as you suggested. It’s called Life360. I am currently writing an article detailing how to set this up with an Ecobee3. How do you shut off he night light? I assume you are talking about the Wiser Pulse feature, right? An intensity of 0 will turn the feature off. “As long as the updates keep coming …” Oh well, so much for the ‘dedicated’ development team and the ‘more to come’ promises. Those deep pockets got mighty shallow shortly after this review was published. With a few more of the right updates the Wiser Air really could have been the best smart stat on the market, but Schneider Electric decided to abandon it and leave those of us who bought one wondering what might have been. Now they’re using the ‘Wiser’ branding for a home automation system; unnecessary because with the ZigBee radio the Wiser Air was already primed to be the hub of a home automation system. Looks like Nest and Ecobee are the champion smart stats with Honeywell close behind and Schneider Electric out of the race.